Algal sample results in the lower York River and lower James River continue to show the presence of the alga Alexandrium monilatum. This species is common in the Southern United States, and has been detected in the Chesapeake Bay since 2007. A. monilatum is being observed in the lower York River near Gloucester Point Beach, Yorktown Beach, and nearby bays and creeks. It is also recently observed near the mouth of the James River and Norfolk beaches. Aerial photography shows patchiness in areas across the Bay and off the Eastern Shore. 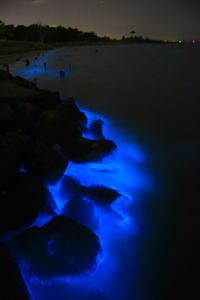 One of the rare occurrences of this algal bloom is that it has been producing bright blue bioluminescence visible at night. It is not currently clear why this alga produces bioluminescence. Most algae do not harm people, wildlife, or the environment. However, some types of algae in Virginia are dangerous and can affect fish and humans, as well as other animals like birds and marine mammals. These are known as Harmful Algal Blooms (HABs). A. monilatum can be toxic to fish at high levels, but there are no published studies indicating it is harmful to people. A. monilatum is not known to produce toxins associated with shellfish poisoning. It is not known if this alga is harmful to pets. 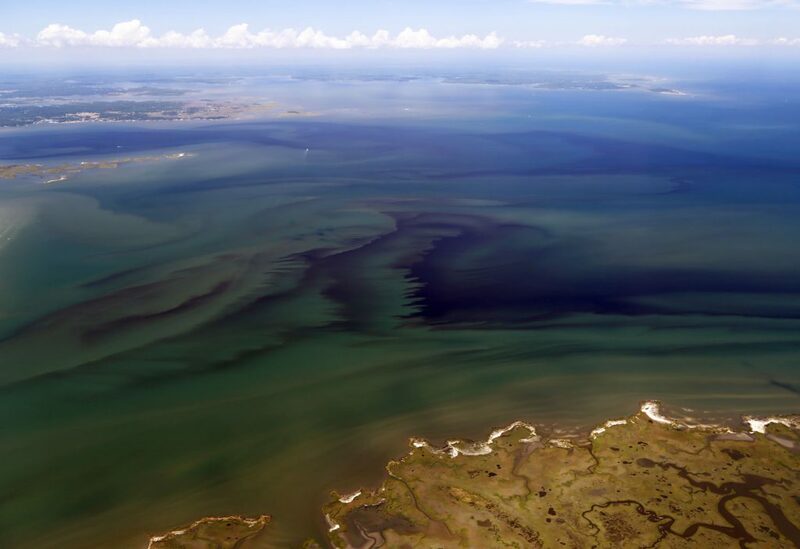 VDH and partners will continue to monitor this bloom event for increased levels of A. monilatum as well as HAB species and/or algal toxins to determine any risk to human health or shellfish. Reports of illnesses associated with this bloom event will also be monitored and evaluated for surveillance purposes. Avoid swimming in areas with a visible bloom, or water with unusual color or odor, or if dead fish are observed in the swimming area. When in doubt, stay out. If you come in contact with the bloom, wash skin thoroughly with fresh water and avoid exposing open wounds or broken skin to the water. If you are concerned about HABs and your health, please see your doctor and call your local health department. Telling your doctor about contact with water and the specific location may help him/her treat any symptoms properly. Avoid swimming in water which is discolored or has an odor. Avoid swallowing water when swimming. Be mindful of children and pets especially, as they tend to drink or accidentally swallow water more easily. Don’t swim in areas where there are dead fish present. Avoid swimming in natural waters for a few days after a heavy rain event. Avoid swimming or wading with open wounds or cuts. Wear water-proof bandages or avoid immersing the broken skin. Wear water shoes to protect your feet. Observe posted signs if any are posted near a swimming area. Don’t swim if you are ill.
Shower with soap and clean water after swimming in natural waters. Be aware of local weather conditions prior to recreational activities and watch for dangerous waves and signs of rip currents. If you become ill or experience tingling, numbness, rash, or skin, mouth or eye irritations after swimming, please contact your medical provider or your local health department.